Our sports team faces make for great media exposure! Our head turning sport team face painting has caught the attention of mass media. Our painted team faces have aired on: NBC, ESPN, ABC, Channel 2, 6, 8, 12, Fox Sports. 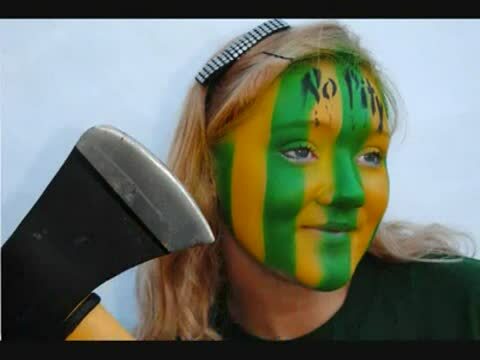 Images of our painted fan faces have been published in: USA TODAY online, The Oregonian, Oregonian online, Willamette Week, Soccer Nation, Portland Timbers Web Site, Portland Trail Blazer Web site. We work hard to support your team. We custom cut all the stencils we need to show off your teams images and colors and will offer your fans the best selection of team faces in the Pacific Northwest. We offer your fans the choice between: Amazing full & partial faces, professional looking smaller cheek art designs, or fun arm or hair art for your fans to sport. These Seattle Seahawk fans got noticed by the cameras and were featured during half time on NBC! These Portland Timber Season Ticket Holders get painted every home game and have been featured in the "Oregonian Live". Our Team face painting makes for the Ultimate Intimidation!! This fully body painted Timber fan was used on "Timbers in 30" Commercial on channel 12, was published in "Soccer Nation" and got to meet the ambassador because of his body paint by Time Honored Designs. Timbers Army member gets his beard painted! Soccer players get airbrush tattoos for their player appreciation party. Time Honored Designs Face painting and Body Art is perfect for: Games, Season Ticket Holder Events, Viewing Parties, Fan Appreciations, Player Appreciations, Team Fundraisers and Promotional Images.